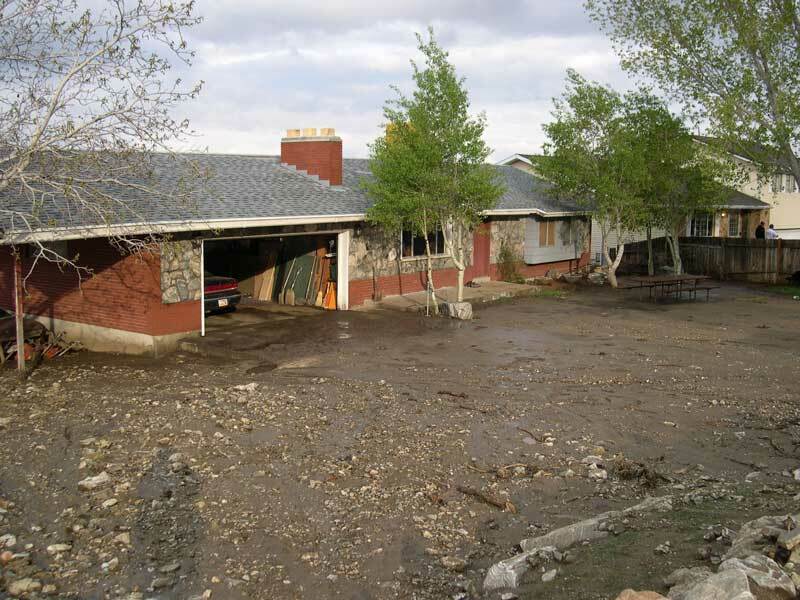 Intense thunderstorms on the evening of April 6, 2004, caused flooding and debris flows in areas along the east bench of Farmington between Farmington and Shepard Canyons. The sources of the floodwaters were mainly small, range-front drainages burned in the July 2003 Farmington fire. 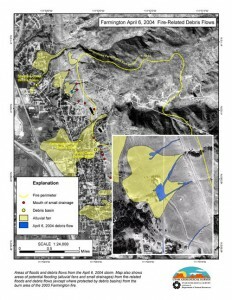 Most damage occurred in subdivisions on small alluvial fans below two unnamed drainages south of Shepard Creek (see adjacent map). 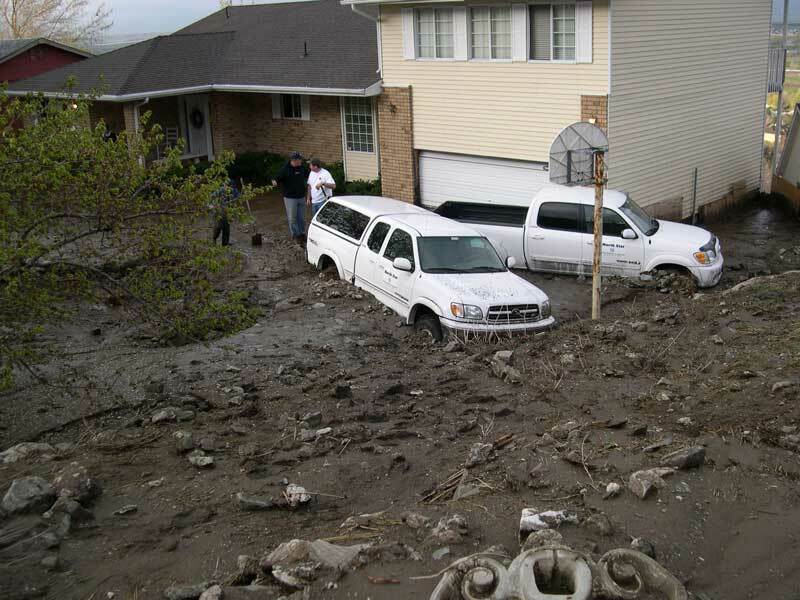 Floodwaters and sediment deposition were mostly restricted to streets and yards, but damage also occurred to several vehicles, garages, and homes (see photos below). At one locality, erosion by floodwaters threatened a section of a Weber Basin Water Conservancy District aqueduct running along the mountain front (see photo below). The lower slopes of the Wasatch Range above Farmington were burned in the July 2003 Farmington fire. Following the fire, the Utah Geological Survey (UGS) assessed the heightened fire-related debris-flow hazard and produced a map showing debris basins and areas of possible flooding and debris flows. Letter Report to Wasatch-Cache National Forest (pdf). A U.S. Forest Service (USFS) Burned Area Emergency Rehabilitation (BAER) team assessed the severity of the burn and resulting increased flood hazard. Following the BAER team assessment, the USFS and U.S. Natural Resources Conservation Service undertook various watershed-protection measures to reduce flooding and debris-flow hazards. These were completed in late fall 2003. Factors probably contributing to the flooding in addition to heavy rainfall and burned hillsides include steep slopes, ample supplies of sediment, and increased runoff caused by already wet soil conditions from recent snowmelt. 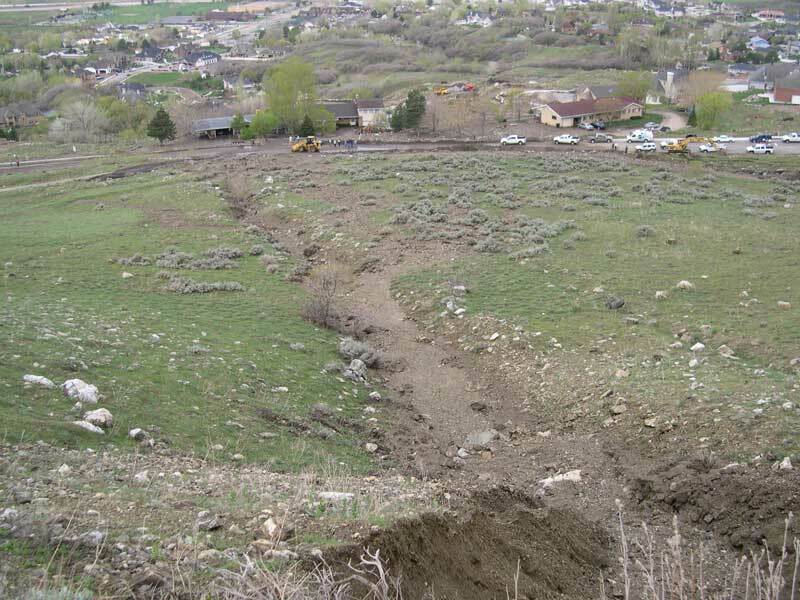 Davis County and Farmington have a long history of flooding and debris flows, and as a result many of the larger drainages such as Farmington and Rudd Canyons are protected by debris basins. However, most small drainages are not. 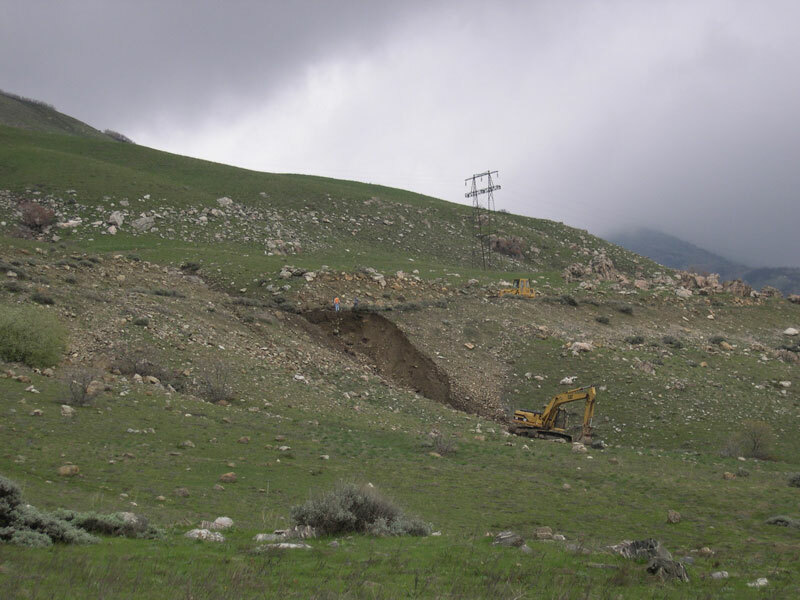 Although emergency watershed protection measures, such as were completed last fall following the fire, are designed to reduce flooding and debris-flow hazards, they do not eliminate hazards and are not permanent. Therefore, the heightened flooding and debris-flow hazard from the fire will exist for several more years while the watershed recovers to preburn conditions. 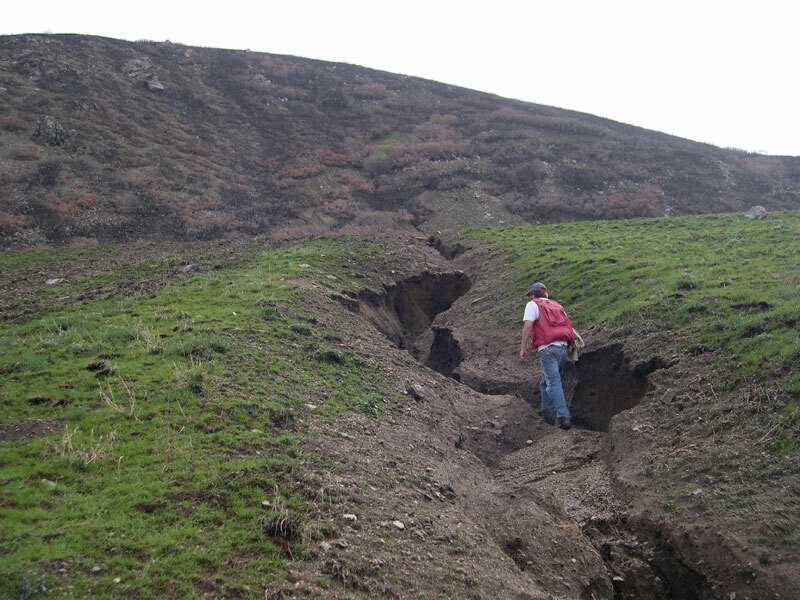 A field survey on April 7, 2004, by UGS geologists found that drainages in the flood area contain ample sediment for future debris flows.